Drown out the sound of drum circles and noisy protesters with one of these state-of-the art sense deprivation chambers. Recipients of this gift can lock themselves away in a shell of perfect peace and relaxation, where they'll be electronically soothed, comforted, and massaged. 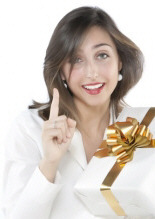 NOTE: The above device is not able to block out feelings of guilt and shame, but this minor glitch can be temporarily overcome by including a few bottles of $31,000 Glenfiddich 50 Year Old Single Malt with with your gift. This genuine $30,000 baseball autographed by Babe Ruth will score a home run with any sports lover in your life. This baseball was made in the United States, unlike the baseballs used in the Major Leagues today, which are hand-sewn in a sweat-shop in Costa Rica. Speed up your inheritance by giving your rich uncle or father-in-law this white gold, jewel-encrusted, $80,000 ST Dupont Ligne 2 cigar and cigarette lighter. They will be so eager to show off their sparkling new toy that they are bound to double or triple the amount of tobacco they smoke, thereby insuring you a quicker road to their riches. 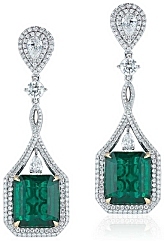 By giving a special lady in your life this $295,000 Emerald & Diamond Drop Earrings, you'll be creating lots of jobs for foreign mercenaries and overseers, and providing "exercise" for the children and (former) farmers who are "encouraged" to spend their time looking for shiny things that bring happiness and joy to the 1%. For $37,000.00 you could provide sustainable solutions to hunger for thousands of people, or you could get this 15-inch horse's head made out of crystal by Lalique, that will look dazzling on any mantle, shelf, or end-table. Out-do the Godfather by leaving this horse's head in someone's bed. Watch what happens when you make them an offer they can't refuse! Celebrate royalty and slavery with this $200,000.00 porcelain Queen of the Nile figurine by Lladro, packaged in Lladro's specially designed sturdy gift box. At five feet in length, it would look smashing sitting upon a $65,000 Lalique Fish Table. Give the poor little rich kid in your life the gift of summer fun all year long with this $19000 water slide. They'll have such a blast sliding into the family's indoor and outdoor swimming pools that they might quit asking to go to the local water park, helping to insure they will not be tempted to mix with the children of the 99%. At a mere $12,500, these alligator belly Lucchese's Limited Edition 125th Anniversary Boots will make any city slicker can feel like gen-u-ine Texas oil man, showing their pride in old-fashioned animal cruelty and ****-kicking Texas Justice.